The Ameise® electric hand pallet truck has fully electric travel and lifting functions to boost productivity. 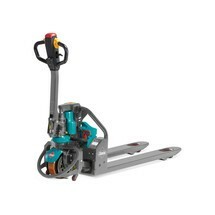 This pallet truck is also the perfect entry model for the electric pallet truck segment with pioneering lithium-ion technology. It is extremely versatile and ideal for transporting via lorry, for loading and unloading lorries and for use in warehouses and stores. You can now leave your hand pallet truck in the corner. The Ameise® lithium-ion electric pallet truck is a great entry model for the fully electric pallet-handling segment. 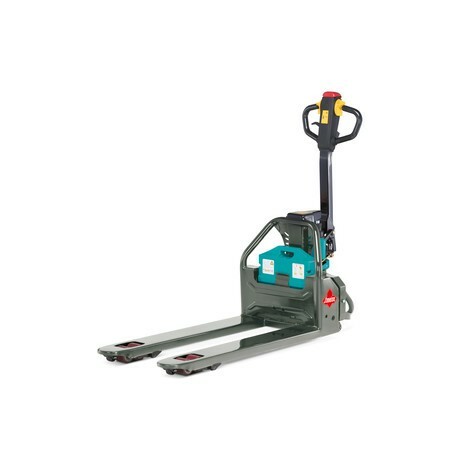 The pallet truck can lift and transport loads of up to 1200 kg electrically. This relieves strain and boosts productivity. This pallet truck also enables you to enter the class of electric pallet trucks with lithium-ion technology. The maintenance-free 48V lithium-ion battery sets itself apart through its sustained performance, quick charging times and extended service life. An optional replacement battery enables long operating times and multi-shift operation. The battery is changed easily within a few seconds via an intuitive process requiring no tools. The external charger (included) enables quick intermediate charging and ensures high availability and flexibility. Control all functions – lifting, travelling with infinite speed regulation, lowering – via the easy-to-use ergonomic control that is equally suited to the left and right-handed. The low net weight and the particularly compact design makes the Ameise® electric pallet truck ideal for the tightest spaces and suited to use in weight-sensitive areas, e.g. for loading and unloading lorries. The powerful drive motor offers outstanding gradeability. The reinforced braking system provides safety on ramps and good braking capability on inclines. The encapsulated and well-protected electronics also make the electric pallet truck suitable for outdoor use. All these characteristics add up to an ideal truck for transportation via lorry, providing reliable assistance when delivering goods right to the door. All Ameise® electric pallet trucks are supported by Jungheinrich service. With more than 3000 service engineers worldwide we guarantee a partner close to you and optimum spare parts supply. The Ameise® lithium-ion electric pallet truck with 1200 kg capacity is our most cost-effective entry model within the electric segment. Experience the benefits for yourself and purchase the fully electric hand pallet truck for a whole host of applications from our shop.